Holographic interferometry is a powerful tool for imaging and measuring dynamic phenomena that impart optical path length changes due to structural motion and vibrational modes, internal stress, electron densities (plasma physics), or fluid dynamics (including sound resonance and shock waves in gases). We will concentrate on using time-average and stroboscopic holographic interferometry to produce still and real-time/video images of vibrational modes in structures (bells, tuning forks, etc.) and of standing sound waves in acoustic resonators. These projects have the advantage of almost endless creative variations by students and bring together mechanics, electronics, optics, vacuum science, Fourier analysis, and acoustics while providing a challenging and flexible environment for student creativity and perseverance. 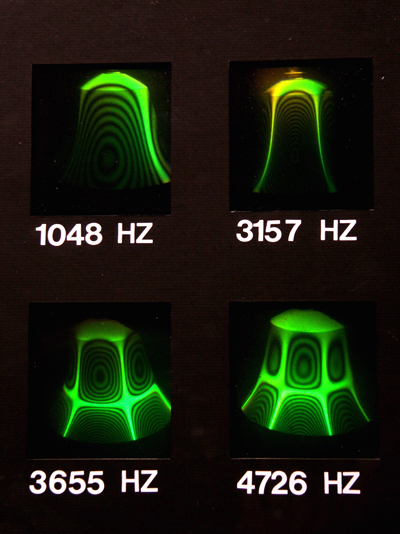 We will go through the steps of making transmission holograms of a variety of phenomena, and in many cases after a laptop FFT analysis of the dominant modes of resonance. 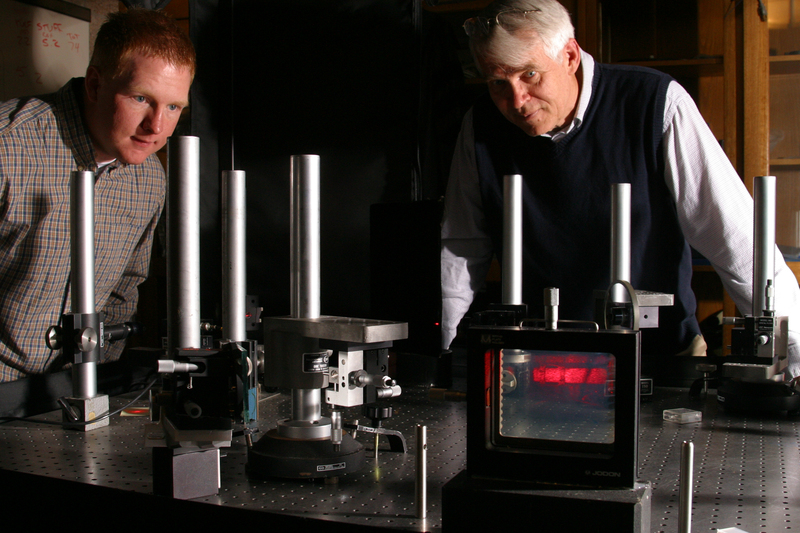 Holographic plates will be developed and processed in a nearby darkroom, and a variety of procedures will be used to create interference and thereby allow a study of the vibratory modes. We will start with time-average holograms (simply making the hologram while the object is vibrating) and culminate with some applications of stroboscopic holographic interferometry—thus allowing one to video record the “slowed-down” motion upon holographic playback. All the holography will be done with a continuous beam, medium power He-Ne laser in the range of 30 mW and with typical exposure times of 2–10 seconds. We will become familiar with the use of acousto-optic cells to rapidly modulate the irradiance of the laser for the stroboscopic work. The final experiment will involve the stroboscopic imaging of sound waves in gases at resonance within a closed tube that is driven to high dB levels by a small speaker. A description of this approach may be viewed and downloaded from the advanced lab workshop presented at the Portland AAPT meeting (http://www.compadre.org/advlabs/items/detail.cfm?ID=10294).